I spend a lot of time coloring Jetpack Jr. There was a time when cartoonists didn’t worry so much about those things.There are many stages in the production of a comic strip, and prior to the era of webcomics, the cartoonist’s involvement often ended with the addition of ink on paper. But that was never entirely true, and for some of the greatest comics artists, Hal Foster, Roy Crane, the comic was not complete until the color key was created–or in the case of some like Richard Corben, the comic was painted. But when we’re discussing comics and cartoonists, whether it’s comic books or comic strips, it’s rare to hear a mention of the role of color on the work. ( except, perhaps, in service to some sort of “realism”i.e., in the service to volumetric rendering, as in the work of Alex Ross.) 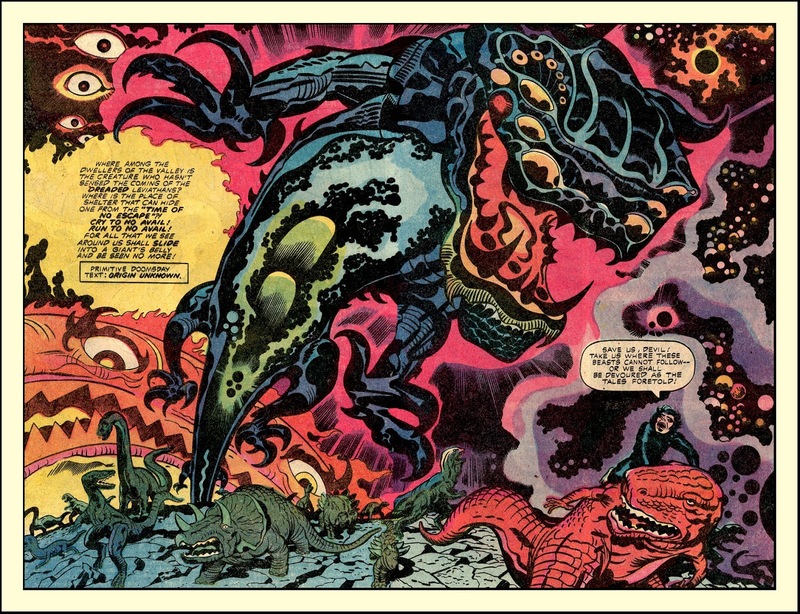 As fans, we often look at those wondrous printed pages by Jack Kirby, particularly those from the late 60’s on, dazzled by Kirby’s graphic power and pop art energy, with nary a word about the role of color in the success of those images. Fans often complain about Roy Lichtenstein’s use of Russ Heath’s war comics, as though Heath’s line work were the only aspect of the comics panel worth acknowledging. Certainly Lichtenstein was equally interested in the color on newsprint and put as much effort into transposing ben-day dots as lines of india ink. More often than not, our discussions around our favorite comics’ artists eradicate any mention of color from the discussion, as though all comics, and comics art, were in black and white. Clearly this is a result of the assembly line approach the comic book companies adopted for speedy production, the industrialized production methods in which newspaper comics developed, and the perfunctory approach often taken to coloring comics throughout a good portion of their history. However, for many web cartoonists, whose strips aren’t under the pressure to appear on a daily basis, the coloring falls to them. And in this context the coloring becomes as integral an aspect of the work as black lines on paper and text in balloons. But our discussions of comics rarely speak of it, or if they do—it’s as though color is icing on the cake, rather than an integral part of the conception of the strip. Obviously, the role of technology, and the final destination for a comic, plays an enormous role in the cartoonist’s process. In the 20th century, strong black lines on Bristol board were necessitated by methods available to the printer. In the 21stcentury, print technology is much more sensitive to a range of subtleties, and cartoonists have a wide array of media at their disposal. Digital destinations allow for even broader palette to draw from, and the options are almost overwhelming. The intricate pen-and-ink work of a Robert Crumb, ideal for black and white on newsprint, has been usurped by digital color in Photoshop. However, it would be a mistake to say this shift is a rejection of cross-hatching per se; it’s a technological shift in the production of comics which has opened the floodgates to a plethora of stylistic choices previously unavailable. For myself, when I began to move from Plastic Babyheads to Jetpack Jr., color, and the process by which I color the strip via Photoshop, was an integral part of the transition; it was there from the ground up. I purposely moved away from the more literal approach to color I’d used in the latter portions of Babyheads, filled with graded transitions in value and hue, to a more stylized approach derived in part from much limited animation from the Fifties( UPA, early Hanna-Barbera); moving from an illustrative style to one more fully steeped in the world of the cartoon. Color( as well as texture) has been as much a part of the world I’ve been building as character design, as the process by which I color in Photoshop has moved my drawing away from line based illustration filled with hatch-marks towards shape-based design. Not only does this move allow for color to speak more clearly –but it is acknowledgment that comics today are, more often than not, meant for a destination in which color is ubiquitous. As a result, color does a lot of the work previously assigned to line. This is not to say that the bulk of narrative heavy-lifting is done by color; obviously in that regard, drawing and text are paramount. One of my favorite webcomics these days offers a wonderful example of the impact color can have on a strip. The Mildly Extraordinary Adventures of Leslie Lawrence by Daniel Saunders is an off-beat strip about the life of fireworks factory employee( and much more and less). The success of Saunders surreal brand of dry humor is dependent upon a world of quiet melancholy; in this case, a world delicately constructed via the sensitive application of apt color choices( as well as an overall general weirdness). 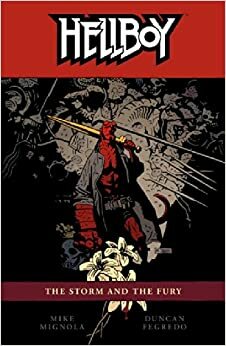 Thinking then about comics created by a team, my thoughts immediately turn to Mike Mignola’s Hellboy(my favorite recurring title) and the powerfully evocative work Dave Stewart has done issue after issue; year after year on these books. Mood is an integral part of Hellboy’s world and Stewart’s color, working with Mignola’s ( or Duncan Fegredo’s) flat blacks, conjures a landscape steeped in Gothic atmosphere, born in the darkest recesses of the mind and spirit. Stewart’s color complements Mignola’s deliberate pacing; his low-lit palette and his subtle shifts in tone and hue put pressure on the brakes as we read. Color is more than icing on the cake, more than mere filling in the lines; it can be a fundamental aspect of a contemporary cartoonist’s voice.